Subaru Mikazuki has loved books all his life, and it is not rare to see him as a writer now that he has grown up. However, for him, it has been a lonely path, and without noticing, he became an introvert man. One day, he decides to adopt a stray cat, and decides to call her Haru. Everything is new in his life; he has no experience keeping a pet, and is having a hard time with his new roommate. On the other hand, every day is a new adventure for Haru, who wants to feel comfortable in her new territory. But sometimes, old houses seem to have some hidden tricks, and the cat is about to discover more about her owner. Without reason, Haru jumps in a table and startles Subaru, the cat seems nervous, however, he cannot tell what is going on. As the day continues, he receives a call from his editor, Atsushi Kawase, who wants an appointment with him to discuss his next work. Subaru hates being surrounded by people, and prefers to stay enclosed at home, working. As soon as Atsushi listens a cat meow, he stops asking Subaru to come out to meet him, instead, he tells him to wait for him. Atsushi seems to like cats, but his wife is allergic, and he cannot have on to pet. And without any particular reason, he decides to visit Subaru and Haru on a daily basis. Subaru is confused, and Haru is even more confused. Once they settle down a bit, Subaru begins to recall his parents, both loved to travel, and even his mother kept photo albums with some touching hand written notes. At this moment, Subaru begins to realize how precious were his parents, and he regrets the past, his actions and some of the things he said back then. Unfortunately, for him, they died in a bus accident while traveling, and Subaru stayed home, with his beloved books. Haru seems to realize there is something wrong with Subaru and does not hesitate to get closer to him. The introvert writer feels a connection with his new pet, allowing him to forgive himself for being selfish with his parents, and looking forward to work with Atsushi and start moving once again. 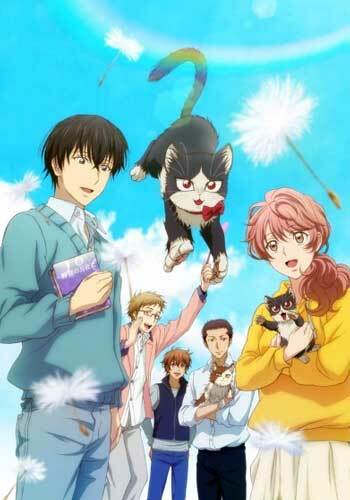 Also known as, My Roommate is a Cat, is a manga series written by Minatsuki and illustrated by As Futatsuya, serialized online via Flex Comix’s Comic Polaris website since June 2015. An anime adaptation by Zero-G premiered on January 9, 2019.